Table Gloves are Handmade in the USA! 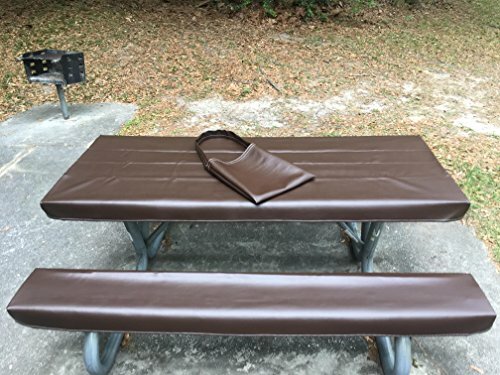 Our fitted picnic table covers require no elastic, straps or weights. They are wind and water proof. Made from heavy duty marine vinyl that is mold and mildew resistant. Our Table Gloves have no fuzzy backing making them machine washable. This 3-piece set comes with 1-table top cover, 2-bench seat covers and a free carrying bag for easy storage and use! As featured in the March edition of Family Motor Coach Association. FREE PRIORITY SHIPPING in the continental United States is included! Top fits 71-73 inches long by 28 to 30.5 inches wide. Benches 71-73 long by 8.5 to 10.5 wide. If you have any questions about this product by Table Gloves, contact us by completing and submitting the form below. If you are looking for a specif part number, please include it with your message.